Can 'Woody' Deliver Facebook Fame to T.G.I. Friday's? By Craig Daitch . Published on September 11, 2009. T.G.I. Friday's is launching a new Facebook campaign, which drives people to a fan page featuring "Woody" (short for Woodward), a 30-something slacker who still lives with his parents. Woody claims to have made a bet with Friday's: If he can accrue 500,000 fans to his Facebook page by Sept. 30, Friday's will give away a free burger to all who fanned him. 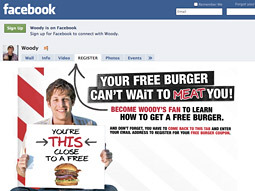 Friday's is supporting its Facebook campaign by running ads on TV using a single call to action -- Woody's Facebook page. The rationale is simple: Why build a microsite when you can target your audience directly on the channel they have the highest propensity of using? Additionally, it's made the video ad content distributable via the page as well as setting up real world Woody meet-and-greets coordinated through Facebook's events calendar. Woody may be fictional but the affinity is very real. As of 9 p.m. Wednesday night, T.G.I. Friday's has collected over 152,000 fans of Woody. The social web has yet to pick up on the campaign outside of Facebook, but given the temptations of a "free burger" it's only a matter of time. All of this seems hauntingly familiar, however. No, not the allure of "free" -- I think it's a great tactic to drum up buzz for the brand as you can look no further than Denny's to see what a pro bono breakfast can do to make you relevant again. I'm talking more about the specific destination. What makes Friday's stick out is the fact that Facebook has always been about "true self." To elaborate, whenever clients would ask to break down in simple terms the differences between MySpace and Facebook, I'd always respond by explaining that Facebook is about who you are and MySpace is about who you'd like to be. MySpace was much more tolerant for branded pages with fictionalized characters -- be it a Square Burger or the X-Men. Facebook, however, created fan pages to give its community an opportunity to stay connected with real people and real brands. In fact, if you think about the lengths Facebook goes to ensure the validity of its members, this comes as a bit of a surprise that creating the avatar Woody would be accepted by Facebook given its community standards. With that said, the campaign isn't offensive and it's well integrated into Facebook's different fan-page offerings. The primary concern I have though is, What happens post campaign? How often will Friday's feel the need to have Woody reach out to me? Will he write on my Wall? Is the permissive nature of Facebook's community going to tolerate it or will this cause for the same wear out MySpace has recently endured? While branded profile pages have been a part of digital advertising for quite a few years now, Facebook, whether aware or not, has changed the rules with Woody and T.G.I. Friday's. While I commend them for using Facebook so creatively, I also worry that the allure of "free" platforms such as Facebook and Twitter could cost brands in the long run. It's dangerous to think myopically without considering the big picture. Answering questions such as what data would you like to collect vs. what is collectible is always a good start. You may also want to determine how to keep your audience stimulated. Remember that social media is about conversation and as long as you keep that conversation interesting, your audience will continue to come back. I'm looking forward to seeing how T.G.I. Friday's tackles the conversation moving forward.